It's funny how emotions run wild with this team. Two weeks ago, we were gushing with optimism after a marvelous performance against Columbus. Last week, we suffered through two terrible results. 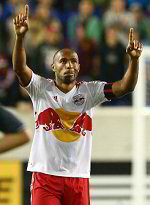 Tonight, all is great once again as Titi Henry turned in a grandiose performance in a 4:1 trashing of Toronto. Emotions ran wild in this match as well. Toronto hit the post early on, and grabbed the lead in the 6th minute -- yet another early goal allowed -- on a perfectly-placed shot from outside the box by Ryan Johnson. Luis Robles, making his Metro debut for the (injured? benched?) Bill Gaudette could do nothing about it. And that was the last time Toronto threatened. The rest of the match was the Metro show, led by -- who else -- Henry. Seven minutes after the opening goal, he leveled the scoring by serving yet another immaculate corner kick onto the head of S. Markus Holgersson. The big Swede hammered home his third of the year. Metro got the lead in the 27th minute. With Toronto applying high pressure, that left oodles of space on their side of the field. Lloyd Sam, making his first start ("Clever" Hans Backe went with a very sensible lineup: Brandon Barklage for the suspended Connor Lade at right back, Dax McCarty at (hooray!) defensive midfield, Joel Lindpere on the left, Sam on the right, and Kenny Cooper partnering Titi up front), make a run up the right side and got the ball to Henry. With a defender on him, the bearded Frenchman sent a no-look pass to a wide open Cooper, who easily converted into the unguarded net. A slew of chances in the second half went begging, with Tim Cahill's relentless work in the box going unrewarded, but Henry would strike again. In the 88th minute, he got the ball to Solli, who had come in for the injured Sam, on the right side. The Norwegian sent it back to Titi, now in the box. With defenders and goalkeeper centering on the magnificent one, he juggled the ball, then once again laid it off for an unmarked Cooper, who took a moment to compose it, and then scored. Titi's third assist matched the team record. And Henry was not done. In the third minute of injury time, Cooper sent a long pass to Titi, who skyed a long curve into the Toronto net. The bearded ubermensch celebrated with the fans, pointing to his red-and-black striped armband. Who knows what emotions we'll feel at the end of the season... But with Titi Henry on our side, here's hoping. Lineup: Robles, Conde, Holgersson, Pearce, Barklage, McCarty, Lindpere, Sam, Cahill, Cooper, Henry. Subs: Solli, Tainio.